Food grade 18/8 (304) stainless steel mesh, this material does not affect the taste of the coffee, and the mesh filter have a strong structure, easy to clean and dishwasher safe. 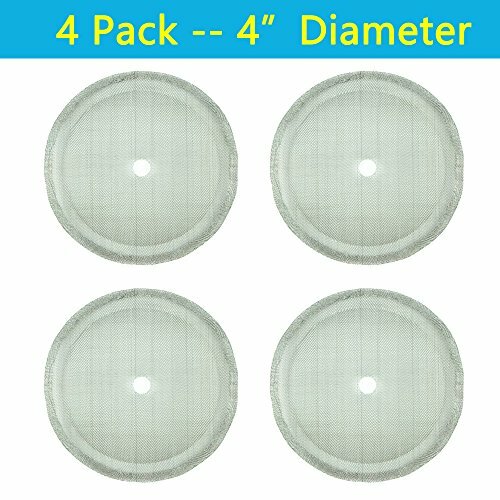 4" diameter, 150 micron ultra fine mesh, so it has a higher filtration efficiency. Bending edge helps to block the ground coffee particles, no gap between the mesh filter and the wall of the french press coffee maker, so you can enjoy a cup of smooth coffee. Easy to clean: just use running water to wash the filter, and it drys very fast, or just put it into a dishwasher. Lifetime guarantee, and free replacement. We provide lifetime service for our products. Do not worry, just contact us about your problem about the product, you can get full refund and return is not needed. If you have any questions about this product by apgarden, contact us by completing and submitting the form below. If you are looking for a specif part number, please include it with your message.